There is great excitement in my life. A dream come true, in a way. The reason this blog has been a bit quite over the past 2 weeks. My 4 year old will tell everyone who'll listen (and she'll make you listen) that mummy has a bookshop now. At home. It's true. It's no secret I love books, and who doesn't have this little dream of their own business? Well, mine involved books. It wasn't "just" a dream - I always had my favourite independent bookshops where I bought books, and spend rather a lot of time thinking up where the perfect location for "my" bookshop and cafe would be (until it was taken over by a cafe...). I even worked in a bookshop for minimum wage just to see if it was for me (it wasn't, the bookshop had no control over stock or any freedom to make it other than a university book service; it was rather soulless). Then, out of the blue, only a few weeks ago, I stopped at the Barefoot Books stall at the Scottish Baby and Toddler Show. They are the people behind many a favourite baby and children's book and a five minute visit meant I came home with a bag full of new exciting books. A week later, and I'd signed up as an Ambassador - which means that I sell Barefoot Books. I'm still in the starting blocks, the great thing is that there is no pressure to sell large quantities and it's really just going to be a hobby. There are decisions to be made whether to use my domain name for the online shop, or this blog, or a page on this blog. On Friday, my launch home party is happening. 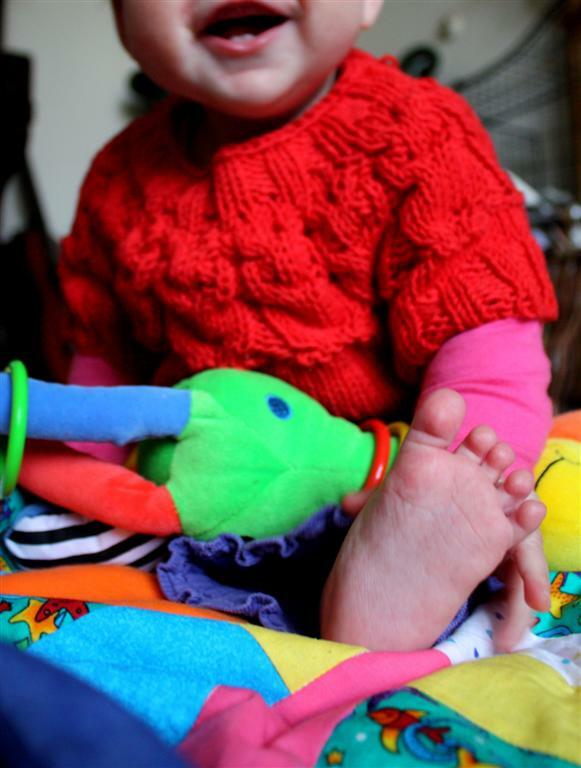 We've been reading Barefoot Books all week, to test them, get to know them and love them. I'm as excited as a child really, because, really, what could be better than selling the books you love? Maybe this is like bringing coals to Newcastle (or owls to Athens as the German version of this proverb goes) because thankfully, most educators these days are aware of the asset that growing up with more than one languages is. It's a great shift - I still remember how they trained my off standard pronunciation out of me and not being able to understand my granny because my parents did not speak dialect with me. So for anyone considering bilingualism for their children, or anyone needing a bit of a boost to keep up the good work, here are random reasons for raising bilingual children. They are random because I'm sure there are more, and do please add them in the comments! 1. Your child will learn a second language without any of the hard work. Learning languages takes consistent and hard effort. Even if you're fluent once, you can lose it if you don't use the language. Children have the unique opportunity to pick a second or third language up without noticing the effort. 2. Your child will be able to learn further languages with greater ease. 6. You will be able to share memories and create memories with your children which you would otherwise not have done. Kind of reliving your own childhood, but also enriching your own memories that may have faded a bit. 8. 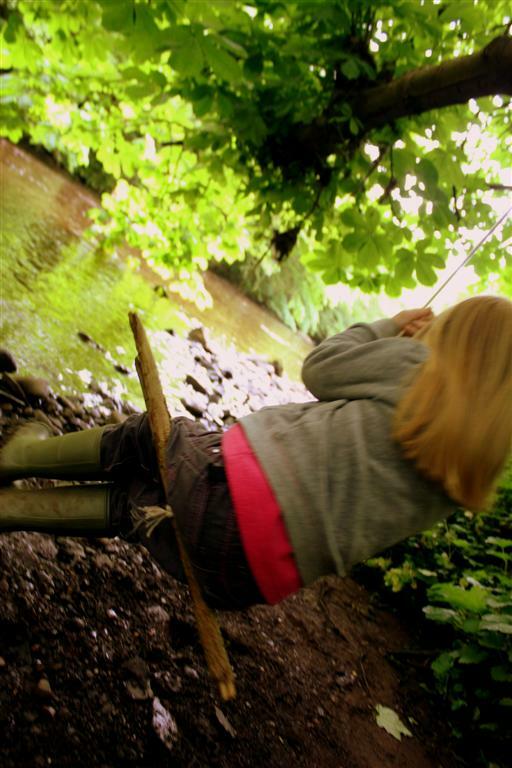 Your child will have natural opportunities to learn more than they would normally: Geography, travel, languages, festivals, maps, flags, words, you name it - there are two worlds to explore, how exciting for a curious mind! 10. You will be able to pick and choose the best from two sets of media. We love Janoschs Traumstunde to bits, and Maus and Elefant prominent features in our home as is The Lion King. Never a daft TV programme again - if you have two cultures to choose the best of children's TV, books, and more from, you'll be spoilt for choice! The weather is raging outside. As I sit and watch the storm damage accumulating, last week seems like an eternity away. Not that the weather was kind, but at least the trees were a welcome shelter rather than weapons. Usually, May brings sunshine, warmth. It tends to be the best month. Instead, we had rain, cold temperatures and now a storm that puts fear not just into my four year old. She insists that the twigs and branches can't possibly have been blown down by the wind, it has to be a woodcutter, because otherwise it would be winter soon. 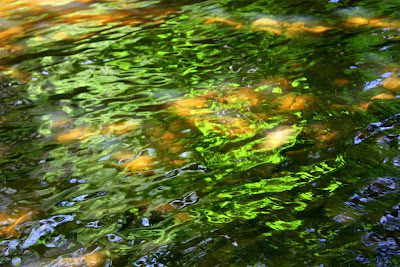 And just a few days ago, the trees were a well of colour, light and easy swinging at the riverside. 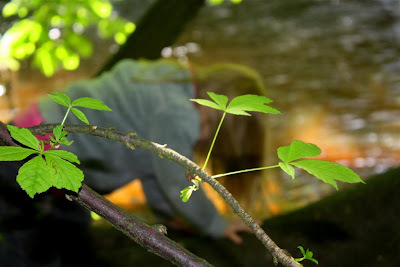 Our outdoor adventures teach me a lot. How on a day that I have to drag myself out, Cubling is more than keen. Ask her if she'd like to go to the woods or stay home warm and dry, and the answer is without fault the woods. She looks forward to meeting her friends, she drags me out, even on days that start with porridge spilled across the whole room. Once we managed to get out of the house, all geared up and with lunch packed, after the stress of getting everything together and getting there, the reward is great. The calmness, the peace, and the ease of a child who in other environments gets overstimulated so easily. She also loves to be there with me, and it saddens me that soon, she will go there without me again. It's my favourite day of the week. Not often do I manage to bring my camera as well as two children, rain gear and lots of food. And it's not easy trying to capture the colour, light and beauty we see on camera if an increasingly active baby is trying to help me take that picture. If I do bring the camera though, it's these pictures that I often go back to during the week to follow, to remind me of the best day of the week, the one where we are all happy at the same time. The big easy. The photos reflections of our memories. This post is part of Outdoor Challenge Monday. This month's bilingual carnival will be host on Mummy do That! 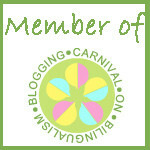 If you blog about raising your children bilingually or any other aspect of bilingualism and have a recent post you would like to submit to the carnival, please post the link to your post to blog @ cartside dot co dot uk preferably by 25th May 2011. It will go live as soon as possible after the submission date. It would be great if you could pass on/promote this call for submissions amongst bilingual bloggers. I apologise for the short notice, and hope that this doesn't keep anyone from contributing! It's great to see the carnival go from strength to strength and becoming a resource for parents at all stages of their bilingual parenting experience. It's great for connecting blogs across the globe, and for me it's offered a lot of support and reassurance especially in those moments where I questioned if it was all worth it (it is, it is). It's a great opportunity to make new connections and renew the enthusiasm for bilingualism. If you would like to find out more about the carnival, read previous carnivals or sign up to the mailing list to be kept in the loop, head over to Bilingual for Fun where the carnival page is hosted. Any questions? Just ask in the comments section! I look forward to reading your submissions. When the most recent research findings about another outcome difference between breastfeeding versus formula feeding hit the headlines, the reaction was once again predictable. There were those who rejoiced in yet another reason why breastfeeding is good for your baba and those who complained how it guilt tripped parents who didn't/couldn't breastfeed or how breastfeeding is once aspect of parenting and surely so many other parenting choices will have an impact on child behaviour. There was even voices that pointed out how useless the research was, how it was a waste of money because it wouldn't make a penny of a difference to mums in their choice whether or not to breastfeed. Now, unlike others who seem to have made up their mind that this piece of research was a waste of money, I believe that as with all research, only time can tell if it was or wasn't good value for money - but hey, that's what research is about! If you questioned every research project in relation to value for money and usefulness, there is a real potential that no research, no progress, would ever happen. It's bad enough that a lot of research has to be funded privately and thus often by people with dubious agendas - but the bottom line is that we need a variety of research to learn, to further ourselves, to progress. So why is research on impact of infant feeding criticised and always ends up opening a can of worms? Why is there a problem with presenting facts? And, above all, why does anyone feel guilt tripped by the reporting of facts? It's all about that elusive mad woman in the attic. Guilt. Mother's guilt more precisely because when did a dad last feel guilty about working full time, or his child not being breastfed? Why do people feel guilty in the first place? Personally, I feel guilty when I've done something knowingly that I shouldn't have done while I had the option of doing something different, i.e. when I chose to do the wrong thing against my conscience. a) mum wants to breastfeed, sometimes desperately so, but encounters difficulties, doesn't get the right support and stops. Guilt factor? There shouldn't be one. Mum should be angry about lack of support, and complain. b) Mum can't breastfeed. This is rare, but for medical conditions or some situations, this might be the case. If you can't breastfeed, why would you feel guilty about it? c)There is the situation where the mother, in full knowledge of all facts, chooses to formula feed, based on her individual circumstances and with very good reasons. Guilt? Why? Sometimes life isn't as ideal as we wished it was and we weigh up risks and benefits and come to an informed conclusion that's fine, isn't it? Done, dusted. d) Mum just doesn't want to breastfeed for one reason or another. Maybe she finds it yucky (yes i've heard that). That is society (culture/peer group) who's given mum that idea, again, mum's not to blame, it's very hard to oppose peer group pressure. Maybe she wants to keep going out/party/continue a life pre-baby or even doesn't want to be tied down to the baby all the time (which admittedly breastfeeding does) - or more likely conforms to peer group pressure to not be seen tied down by baby. Even I feel this pressure to just continue as usual, I see the looks I get when I used a lunch break to feed my baby, the apologetic "she doesn't take a bottle" that I still offer in explanation as if I had to justify myself. It's hard to breast feed exclusively, even if you're in a generally supportive peer group, how hard must it be if you're not? Again, mum shouldn't feel guilty if she gives in to this pressure. So why do we feel guilty? Why do we read into every presentation of facts that demonstrates why it's better to feed human milk to human babies, rather than modified cow's milk that anyone formula feeding should feel guilty? Research findings present us with facts. I don't get why fact finding is criticised. To claim that it won't have an impact on infant feeding choices is presumptious in my view - if we had figured out exactly what impacts on infant feeding choices, we wouldn't have those unbelievably low breastfeeding rates in some parts of the UK that I've quoted before (just as a reminder, there are various areas in Glasgow where rates are as low as 8% at the 6-8 week checkup - compare this to 95% in some countries). Now, these rates are too low by any standard and we absolutely need to do something about it. It's not about guilt tripping those who've made their choice - that's done and no research will change those choices or bring back the lack of support or whatever else that led to them, but it's about our future generations, it's about all those mums-to-be out there who are making their choice now and in future. In a climate where everything non-statutory is being cut, breastfeeding support is waning and becoming more than patchy. And if there's one thing that's needed, it's quality support. It's vital that at least some voice out there keeps the importance of infant feeding on the agenda because there is an established link between low rates of breastfeeding and health inequalities in later life. Of course this is not just due to breastfeeding, and of course other parenting choices impact too (such as quality time spent with child every day, such as healthy weaning diet, such as access to exercise) but we can't exclude breastfeeding just because it doesn't sit well with us and formula has become oh so convenient like ready made meals. And as long as formula companies are allowed to market their product in rather questionable ways, shouldn't information marketing/promoting human milk be welcomed at the very least as a healthy balance? And how about we mums take a stance to market our product, regardless of how we fed our kids? It's cheap, convenient, high quality, no risk and tastier. Nevermind the feel good factor of being able to supply all your child needs. How come it's ok for formula companies to take airspace, advertising space in neonatal packs and the like, when research demonstrating the goodness of human milk is criticised? How come that at prenatal breastfeeding workshops facilitators are accused of being pushy when all they do is provide information and allow debate, and sometimes are even accused of being breastfeeding nazis (Breastapo is the word that I take real issue with. Nothing excuses using the evil of the Nazis in a wordplay on those promoting breastfeeding. Nothing.). Back to the whole guilt issue. Guilt is a personal feeling. Information doesn't make us feel anything. It's neutral. How we respond is our personal choice. So to everyone who feels guilty, nobody is making you feel guilty or trying to do this, honestly. Unlike the suggestions on many platforms, news media or blogs, the research is not publish to make people feel guilty or to hit them with the breastick. Often, guilt is a sneaky feeling that turns something which should have an outward direction inward towards and against a person. Thus, instead of feeling angry with the lack of support to succeed in breastfeeding, we feel guilty for not managing. It's destructive at worst (PND anyone?) and unproductive at best. How about we just stopped feeling guilty? How about we replace it with responsibility, knowledge and confidence? New babies, growing babies, growing children. So many reasons to knit. It also keeps me sane to make things, not sure why, it's like a drug. So my needles have been busier than usual, with the typical breaks, because my teething baby struggles to stay asleep at times. Cubling had been due a cardigan for a while, as the owlet jumper I knitted for her turned out just very wrong (I now know where it went wrong but unsure how to fix it, must consult someone more knowledgeable on the knitting front if there's anything to be saved), and as 4 year olds no longer wear what their mummy picks, I let her choose her favourite cardigan out of all my knitting books, plus the colour scheme. It's the Heart-motif Cardigan, the main yarn is Rowan Milk Cotton which is very light and drapy, great for the breezy summer we tend to get here. The yarn for the hearts is a mix of various cottons I have in my stash, which makes for a bit of bumpiness/relief, which if unintended, is quite nice. 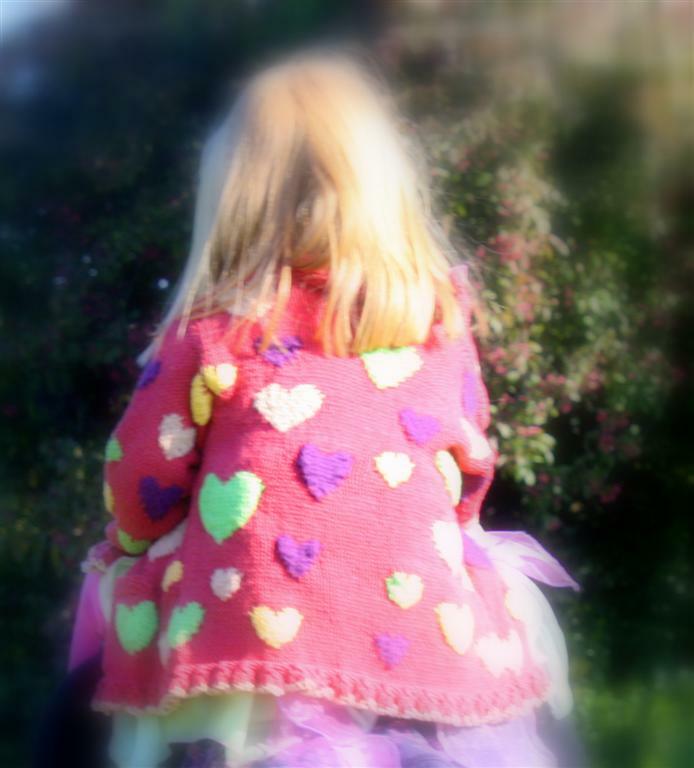 My favourite bit of the cardigan is the frilly edging. My least favourite part: weaving in the many ends, 2 per heart plus the usual suspects. I made it size 4 years with a slightly bigger gauge than in the book, so it should last her two seasons I hope. 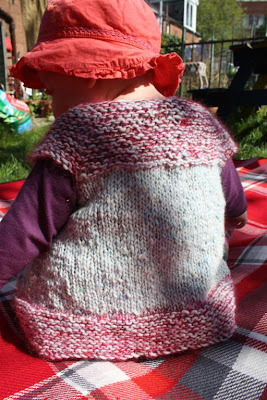 And for new baby C., I whipped up this simple vest which is such a quick knit and looks rather adorable methinks. Ideal for quick knitting satisfaction - I managed to do this in just 3 days. 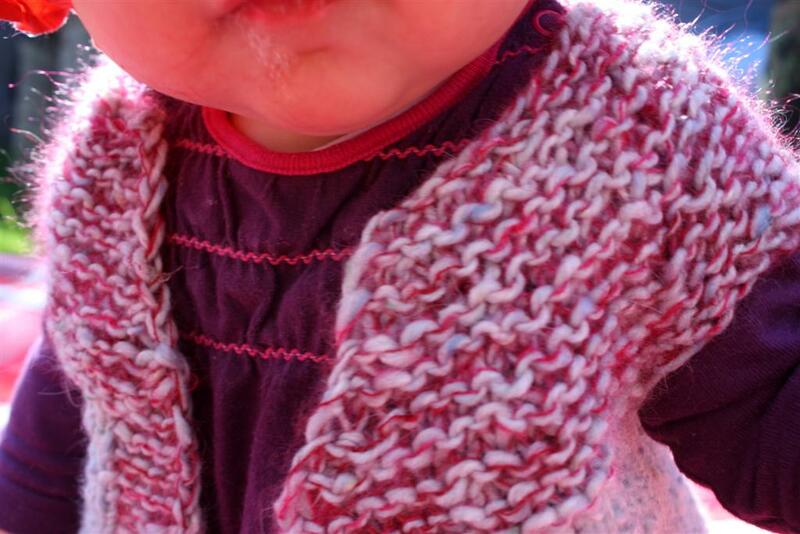 I used Debbie Bliss Donegal Tweed Duck Egg as the main yarn (it's a contender for my favourite yarn ever, it's unbelievably soft) and added a thread of Rowan Kidsilk Haze to the garter stitch parts of the vest. 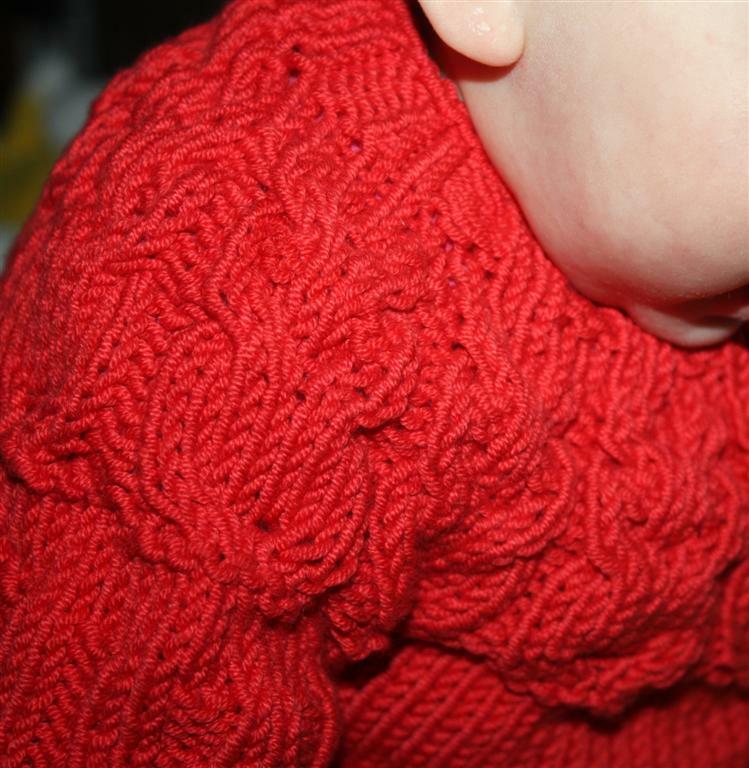 The sizing is for a one year old, but as you can see, it looks quite nice modelled on a 7 months old. I have a feeling that I'll knit another one for Snowflake because she just looks fab in it and I have just about enough yarn leftover to make another one, now if that isn't a sign I don't know what is. Finally, I just had to knit the Owlet jumper again, just to show that I can do it. While it's made using the owlet pattern, size 6-12 months, I decided to make a short sleeve version for the sake of variety, but also because I found the arms a bit tight for my liking when I knitted it a while ago. I'm quite pleased with the outcome. I like the pattern because it looks as nice on a boy as it does on a girl, and there aren't many patterns out there that do! It'll clad a baby girl yet to be born (when knitting it I didn't know if it was going to be a boy or a girl), and I hope it'll keep her warm this winter and maybe even next, as the yarn is quite stretchy. I used Lana Grossa Nico for this, which I picked up in a German yarn shop. It didn't catch my eye instantly but came recommended and it definitely is easy to knit with and just perfect to show off the owlets. It's a very soft cotton yarn - classic, easy wash and bold colours. And, believe it or not, I have exactly enough yarn left to knit another one. Which leads me to think that maybe I should because it's unlikely the yarn would be just right for another project. After all, there are another two babies on the way, so it all makes perfect sense, doesn't it? 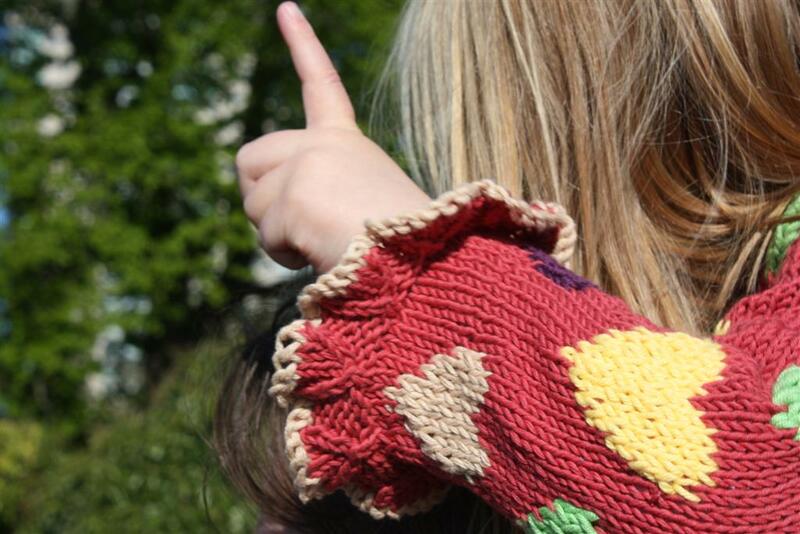 It's no secret that the cost of childcare is huge and rising, but what can be done about it? Recent research by the Daycare Trust estimate that it costs an average of £177 a week for a full time nursery place in Britain for a child under two – which is like paying another mortgage. And if you have two children in childcare, well, what can I say? We pay the most in Europe (bar Switzerland) and our costs are one of the highest in the World. Making work pay? I laugh in your face Mr Cameron, because I'm not sure it really does for the majority of people with children under five. Today the charities Save the Children and Daycare Trust launched their campaign on the cost of childcare. As part of the campaign, they want to find out what impact the rising costs of childcare are having on families; from forcing them to cut back on household essentials to making it difficult for parents to find or keep jobs - especially the poorest who could be priced out of work because of the rising costs. They’ve launched the biggest ever survey of parents in Britain to find out how childcare affects their lives, what they think about it and what can be done to help them. The results will be used to show the Government what impact the high costs are having on families. Every parent/carer can fill in the survey and by doing so, have their say. So if you are a parent, regardless of whether you are currently using childcare (because you may not due to the cost) now’s your chance! - www.savethechildren.org.uk/childcare. PS, please do blog about this and share the survey amongst your networks. The more parents/carers respond, the stronger the voice that Save the Children's and Daycare Trust's campaign will have to influence the Government. As you may know, my babies are mostly cloth nappied and I've used a variety of different real nappy types. So I was only too happy to try out a new real nappy give my verdict on it. Amanda from Baby Bum Boutique sent me a Bright Star Baby All in One Nappy to try out and to give away to one lucky reader. The Bright Star Baby Nappy is the first All in One (AIO) I've used. AIO are basically the closest to disposable nappies in relation to ease of putting on baby - it's just like a disposable, just that you can wash it. While I don't have any comparison to other AIOs, the Bright Star Baby worked really well for Snowflake. It comes with the usual adjustable poppers and thanks to soft elastics, a perfect fit is quickly achieved. It closes with side poppers which are great for adjusting for the perfect fit around your baby. And because it's not velcro - chances are it'll stay on baby once he/she has figured out how to undo velcro! Its insert is bamboo and folded three times which translates to really good absorbency even without a booster. The insert can be popped out for washing, or, in my case, for drying. Being bamboo, it's very absorbent but also takes that bit extra long to dry (which is logical, the more a fabric absorbs, the longer it'll take to dry). As I don't use a tumble dryer, it works well that the insert can be popped out and dried separately. The nappy is slim fitting, so it will fit under all those clothes designed for disposables wearing babas. The nappy is super flexible, and fits tight yet gentle on baby. It's super soft thanks to being bamboo. It comes in a range of funky designs - so it also has something to show off. In fact, it caught the eye of many people who don't use cloth, which is right up my street because you can start an chat about real nappies and how good they are these days! I've used the nappy a good few times now - it's still as soft and its absorbency is comparable to a disposable. I've had no leaks, and ended up wondering why I didn't get AIOs from the outset. I mean, really, what could be better than softest bamboo on your baby's bum and striking designs for your eyes? Save money and the planet as well, it's all good. Done. Draw will be on Friday, 13th May at 8pm. Do check out Baby Bum Boutique for some special offers to celebrate Real Nappy Week, you may find a great bargain. So they found yet another "benefit" of breastfeeding. This time it's all about the child's metabolism: "It could impact your child's metabolism." The article goes on to describe the different behaviour of the metabolism of a breast fed versus a formula fed baby. What strikes me as wrong about this article is that it talks of "benefit of breastfeeding" and breastfeeding having an effect on the child's metabolism. This implies that the "normal" way to feed a baby is formula feeding. And if you're brave and breastfeed, hey, you may reap a benefit! However, it's really formula feeding that impacts on the child's metabolism. This is because in a world where the baseline is breastfeeding (we're mammals, hello? ), this does not have an impact but is just the way things are, because human milk is what human babies drink. The research, then, shows that formula feeding has a negative impact on the metabolism of the baby. Yet somehow, this is not the way the media puts it and it leaves me wondering why. Is it because the media is daft and unwittingly promotes the normality of formula feeding? Or is it out of fear of guilt tripping any formula feeding mums? (NB: the whole guilt tripping thing about formula feeding is another post in the offing, so I leave that unelaborated for now - let me just say that I think nobody should ever feel or be made to feel guilty) Or could it be that they fear the wrath of the baby food industry in the form of being sued? Am I missing something or is it just me who finds it odd that breastfeeding is labelled as having benefits all the time, but formula feeding is never labelled to have a potential negative impact? As if, by breastfeeding, you're giving your child something extra. When in fact, by giving formula, the child gets something less. Then there's the invariable comment on the fact that one breast fed child had allergies while a formula fed child didn't. As if anecdotal evidence ever won against scientific facts. My baby had pneumococcal meningitis, which is linked to formula feeding, yet she hasn't had a drop of formula so far. You know what? There are no guarantees. If you breastfeed you have no guarantee your child will never have allergies or will not fall ill with a tummy bug or be forever healthy. And of course there will be lots of formula fed children who won't get allergies, who won't have tummy bugs. Yet it's still true that formula feeding increases the risk and that every parent should know that formula feeding carries these risks - and then make an informed choice between the two. And not end up topping up like I did without knowing that this innocent little bottle of formula destroyed a virgin gut at 12 weeks, and again at 20 weeks when told to do so by a German pediatrician. (I don't feel guilty about this because at the time I didn't know. Now I do and wouldn't do it again). For the record, I was formula fed, I do have allergies and a tendency towards weight gain. There may be a link, but who can tell? It might be just in my genes. I don't blame my mother at all - she was told she couldn't breastfeed (though I doubt that this was really the case) and at the time this was not questioned and formula was considered to be as good. She did as best as she knew. Today we know better and there should be sufficient and quality support to help everyone to successfully breastfeed who wants to breastfeed, and information for every parent to be that doesn't just talk about the "benefits" of breastfeeding but also the risks of formula feeding, so that they know the facts and don't find out, like me, after well over 2 years of breastfeeding. And all of this without the guilt tripping of course. Here in Scotland it's a big day tomorrow. We don't just have a referendum to respond to, but elections for the Scottish Parliament. It's a bit odd that the referendum on AV is coupled with an electoral process for electing the Scottish Parliament which is much more "progressive" (a word that Mr Cartside used and which of course contains a value judgement). Coming from a country where proportional representation is supported by everyone as a fairer system, I am biased towards proportional representation. Personally, I think AV is half baked, but a tad better than FPtP, so I'll vote yes. However, I also see FPtP as a very British institution. The UK is maybe the oldest democracy in the Western World, and has a great tradition of governance. FPtP is part of this and I can understand that it's cherished and rightly so. It is maybe part of the British identity, national pride even. This is a country where democratic principles can live alongside a strong monarchy. I'm no monarchist, in fact, I absolutely loathe the principle, but I also admire Britain for the ability to pull it off and get the whole world to love and adore the newly wed couple. And of course, Britain does not have the same history as Germany; which is why the country as such is able to trust an electoral system and governmental design which could be abused (but never has been). So I'm easy in relation to the referendum. To me, AV is a slightly fairer version of FPtP. It is no real departure, just a variation. The Scottish Parliament election, to me, are more of a compromise, by marrying FPtP and PR. Some years ago, I taught undergraduates all about the German political system, and about the Scottish electoral system too - it was the time between Referendum for a Scottish Parliament its first election and the first term. Exciting times. However, none of the undergraduates knew that there was an element of PR in the Scottish Parliament elections. Therein lies the problem. If the electorate doesn't know how to play the PR system, it's potential is wasted. I hope that tomorrow, people know that they have two votes, and two opportunities to create a parliament for Scotland. As for my constituency, Labour and SNP are the two constituency candidates that are head to head. So with my first vote, I'll be voting for the party I wish to see leading the country. With my second vote, however, I will take the opportunity to support a smaller party in the hope that they will get enough votes to maybe even form a coalition with the winner of the elections, thus making a real difference to Scottish politics. Truth be told, I'm more excited about the Scottish elections than the referendum. Which actually, isn't that surprising at all. As ever, we'll be making a family event out of it, with all four of us walking to the polling station, and no doubt meeting our canvassing neighbour there. Over four years into our parenting adventure, we actually made it to the Scottish Baby and Toddlershow in the SECC this weekend. Somehow so far I hadn't been organised enough to make it, and it only happened thanks to receiving some free tickets thanks to Emma's Diary that it finally happened - just the kick in the backside that I needed and I'm rather excited to share my impressions and favourite exhibitors. There's nothing like reviewing an event that had me enthusiastic about a good few exhibitors and that entertained Cubling all day long (including meltdown which I knew was going to happen but thanks to a giant Woody we turned the corner). Oh and there were a few Cartside rants too, of course, I just can't bite my tongue when someone tells me how I'm creating bad sleep habits because I rock or feed my baby to sleep. I should know better than to listen to self proclaimed Baby Sleep Gurus (and can't help myself, I do enjoy a rant you know). I'd like to share some of my favourite exhibitors - those who had products to offer that I found excellent or useful, as well as some of the bits that I thought were missing or annoyed me a little bit. On the whole, I was positively surprised by the wide variety of products, services and information. Of course you had your heavily branded and large companies, but there were lots of small ventures and initiatives too which made sure the Baby and Toddler Show is an excellent opportunity to find out about all things relating to baby, toddler and beyond. 1. The Creation Station: The children's arts and crafts workshop people had a large area where children could get crafty. Cubling loved it and really made some fabulous things. The staff were brilliant and clearly loved what they were doing. We came home with some really nice and big items that now have a proud place in Cubling's bedroom. 2. Knitknacks: This is a little side business for the love of knitting. You can get absolutely stunning hand knitted vests, cardigans, and baby blankets from this Scottish lady. I adored her items, and only didn't buy anything because, well, we're not exactly short of hand-knitted stuff. 3. Tots Bots: What can I say, both my girls' bums are cuddled in Tots Bots cloth nappies. There are lots of great cloth nappies out there, and still I return to Tots Bots again and again. It's a Glasgow business, and by gum, they do a great job and beat the price of other brands too. As of now, Snowflake has a 24 hours clothed bum - some night nappies were purchased and I can declare that we've made the big scary move to say by by to disposables for good. 4. Baby Boom Boom provide multi-lingual musical fun and have created bilingual nursery rhyme cds - and yes, they proved me wrong when I said to Mr Cartside " I bet they don't have an English/German DC". (I'm rather disappointed that most bilingual products come in English/French or English/Urdu and it's rather hard to get by anything for our language pair which surely isn't an unusual combination). Basically, their nursery rhyme CDs provide second language version of popular British nursery rhymes. I can't comment on the quality of translation, but it's a great idea and there should be more of this! 5. Born Outdoors really fills a gap in the market. How I struggled to get hold of good outdoors clothing for Cubling - with only one retailer in the UK providing them by online order there wasn't much of a choice. Scottish based Born Outdoors brings Scandinavian quality and design to the UK. 6. Barefoot Books: Quite a few of our favourite ever children's books are published by Barefoot Books and I was delighted to see their stall at the Babyshow. And so was Cubling, what with a goat puppet drawing her in. She instantly made friends with the Barefoot Books Scotland Ambassador, and I was able to browse the full selection of books on display and went away with a few new story treasures. I particularly liked the collection of stories from around the world with CDs to listen to which are ideal for children from 4 years of age. 7. Ethical Classics make, er, well, ethical classics clothing. The company is founded on ethical principles, both in the production of clothing and their own operation, and the clothing is just stunning. I'm not one who gets excited about clothing (hand-made excluded) but their ranges really is to drool over. It really is something different, simple, timeless beauty. 8. Raindrops is another Scandinavian outdoor clothing shop for kids, based in West Sussex. I'm pretty happy to see two shops specialising in kids' outdoor clothing and have bookmarked both shops for future reference and forest kindergarten shopping. 9. Fill your pants: For anyone looking for advice on the wide range of cloth nappies on the market, Fill your pants was the right pit stop. If there was one mission I had when going to the babyshow it was to find some night cloth nappies, and the nappy gurus at Fill your Pants were just the right people to put me on track, even though it meant I didn't end up buying from them. 10. Meningitis Association of Scotland: There is no way I could not mention this stall, and the important work this charity does. In particular, they currently highlight the availability of Strep B tests for pregnant women. Many women carry Strep B and if baby is infected, it can become seriously ill after birth. This can be prevented by testing for Strep B before baby is born - however, while the test is available upon request, it is not generally offered to pregnant women. So, if you're pregnant and worried you may carry Strep B, do ask for the test and you'll get it for free on the NHS. I didn't know it was available and would definitely have requested it. However, I thought it was a shame that there wasn't a single stall specialising in baby slings, while the buggy/pram area was massive. Considering how much I use my sling in comparison to other baby gear, and how I wish I'd never wasted the money on a pram, I feel that this is a real shame and means many parents-to-be miss out on information on baby slings. Similarly, there was no stall focussing on breast-feeding information or support. It is guesswork why this is so, but I think it may be something to do with the cutback in breast-feeding support and the nature of how this support is organised. I was pleased to see that most exhibitors provided cloth or paper bags for their publicity materials, but unfortunately some of the major players still hang on to plastic. I'm not going to name and shame though as I didn't manage to speak to them and ask why, which I really should have done. Another slight annoyance is the never ending collection of my personal details. I have my ways of tracking spam - but in general I do wonder if it's really so important to have all possible ways of contacting me. I'm more than happy to give out my email address, should that not be enough? Once again I can only wait and hope that my address is not sold on and we receive even more junk mail that goes straight to the bin. The day was definitely worth it, I got myself some lovely night cloth nappies and beautiful books, plus lots of information. Cubling absolutely enjoyed herself, the highlight of the day for her was meeting Woody, Mickey Mouse and Peppa Pig (though she was sad that Buzz Lightyear wasn't there) and Snowflake was rather amazed by all the buzz and balloons.